Several questions have recently popped up regarding storing linens. One person wonders how to store them in order to identify and keep them for the next generations and another asks how to store them so that they can be accessed for every day use. 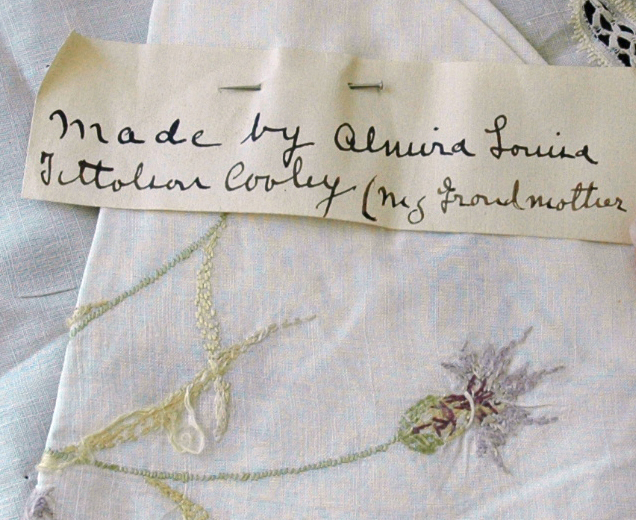 To find a note attached to an antique linen is a treasure! It can convey so, so much! A note can clarify (or muddle) all sorts of things: identification, origins, ownership, dates, materials, family relationships, lore, stories and more. I have seen many ways of handling this issue, all with varied results. For those of you who have not yet contemplated a project such as this, here are my suggestions for what should be included. Record any information that you have regarding the piece and cite the source of that information. Think of the five “W”s: who, what when, where, how? (Smith family Christening dress. Made by Mrs. Smith of Park Place, NY, circa 1898. Written by me in 2025, Jane Smith Doe, NY, NY. Great Aunt Hattie told me all about it when I visited her in Ohio in 2001.) Simple. As much as I hate to see a big old rusty safety pin piercing a dress or a napkin, I would much rather have that with the note than not have a hole and not have the note! 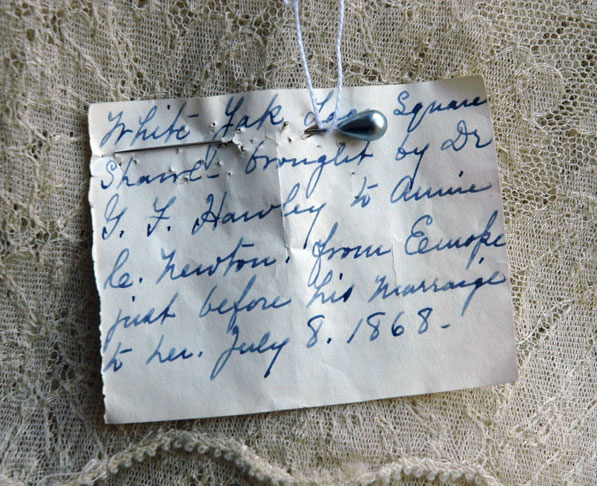 Museums write (or print) in indelible ink an inventory number onto cotton tape which is then sewn onto the edge of an item. The inventory number is recorded elsewhere in a catalog or computer file along with pertinent information. The simplest adaptation would be to write in indelible ink (a sharpie) on cotton tape and sew or tie the information to the item. Here are some actual notes that come from items I have had. 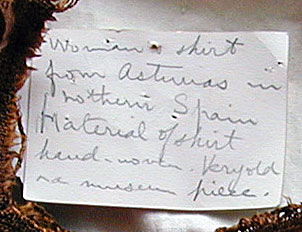 This note identified a piece’s origins: Asturias, Spain. Would that the writer had dated it herself! The next note identifies the maker and her relationship to the note’s writer. This note tells a little story. Also very sweet! The danger of not attaching a note to an item is that the note may become separated from it. But it’s not such a problem if you have only a few family items. If you have a piece that is exceptionally important or sentimental, consider buying an acid free “museum box” for it. Even easier is to place it inside a cotton pillowcase along with any pertinent related information such as an older note along with a note from you and a family photo of the item in use or of it being displayed in your home or of the person to whom it once belonged. Separate the fabric from the documentation with acid free tissue paper. Reminder: store clean but un-ironed in a dry dark place. Larger collections will be more challenging. If you have inherited or collected a large number of items, sewing or tying notes can become time consuming or it can be the start of an interesting project. You can loop cotton thread or twine through a note and through a buttonhole or cutwork and openwork areas but items with no openings are harder. I purchased a “fine clothing grade” needle gun that inserts tiny plastic fasteners, just like the ones they use for price tags on clothing. I try to insert the needle through existing openings like hemstitching or buttonholes or I put it into the least obtrusive place I can find. On a large and sturdy item, writing with indelible ink on an interior hem or hidden area is easy and quick. Purists may not love that idea but I believe that if your choice is to mark it or not, it is far better to mark the item. The method you choose will depend on your patience and fastidiousness. The important thing is to start! This entry was posted on May 25, 2012 at 7:40 pm and is filed under storing antique and vintage linens. You can follow any responses to this entry through the RSS 2.0 feed. You can leave a response, or trackback from your own site.